After a little discussion of what creativity is, we start off with the now very familiar story of DeepMind's AlphaGo and its astonishing ability to take on the hugely challenging game of Go. Even though I've read about this many times before, du Sautoy, as a Go player and mathematician, gives a real feel for why this was such a triumph - and so shocking. Not surprisingly he is also wonderful on what mathematicians actually do, how computers have helped them to date and how they have the potential to do far more in the future. After all, mathematics is by far the closest science to game playing, as it has strict rules established beforehand, where with most other sciences we really don't know what the rules are and have to try to work them out as we go along. My only slight moan about the mathematical aspect of the content is that there are so many references to the mathematical discipline of symmetry and group theory that it would have been nice to have had an a little backgrounder on these to put what is being talked about into context. Having said that, though, given the inevitably slightly scary aspect of AI potentially taking over some of the roles of mathematicians, du Sautoy gives us an excellently balanced and fair assessment of how some mathematical AI projects really do very little to advance the field, while others really do eat into the mathematician's work. Perhaps my favourite chapters of all were those on music. There is, of course, a distinctly algorithmic feel to composition theory, and du Sautoy really makes his exploration of this delightful. I'm familiar with a lot of Bach's work, but not The Musical Offering - which du Sautoy argues well was a particularly algorithmic feat. Apparently, Bach was asked if he could improvise a fugue from a very tricky 'tune' dreamed up as a challenge by Frederick the Great - not only did Bach manage a three part version on the spot, he went on to compose 11 variants using all sorts of remarkable modifications. A particular bonus was being able to summon up The Musical Offering on Spotify (itself an algorithmic marvel on a good day) and listen to it as I read the book. I wasn't quite as taken with the sections on art. With modern art it's arguable that it's pretty much impossible to define what good art is (du Sautoy points out how difficult it is to fake a Jackson Pollack if you know technically what to look for... but I still find his paintings a visual mess that I wouldn't hang in the toilet, so I don't really care that it's hard to reproduce). With such an arbitrary borderline between creativity and randomness, it's hard to worry too much about what an AI can do - it all seems to be a matter of fashion anyway. These chapters were still interesting, just less significant for me. My interest revived, though, when he got onto approaches to writing, even if there was nothing there that seemed likely to displace human work any time soon. 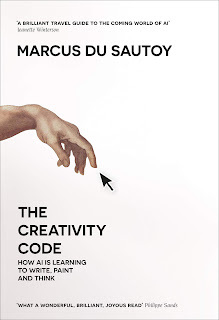 All in all, a great crossover title between computing, mathematics and creativity, presented with du Sautoy's usual charm and clarity. Excellent.